LinkedIn surprised users this week by updating its company pages with a few features that marketers will find valuable. Taking a page from Facebook, the popular business social network has released new metrics consisting of engagement, follower statistics, and demographics. The site also now offers targeted status updates, which allow for your company updates to reach a specific desired audience. New MetricsCompany page administrators now have access to Follower Statistics, a tab next to Overview in the company page navigation. Graphs there give you a more in-depth look at how your followers have increased from month to month. There are also stats available that compare numbers like Total Impressions and Company Updates from the current week to the previous week. 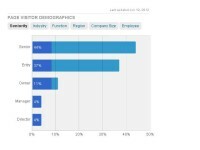 There is also an advanced look at your Follower Demographics that breaks them down by job type, industry, region, etc. If you regularly post company statuses, then a new helpful graph shows how your updates are performing in terms of Clicks, Likes, Engagement, etc. similar to some of the data you can get from Facebook’s Insights. Targeted Status UpdatesAnother great feature just released is the ability to select a specific demographic who will receive your company status updates. Amongst your company’s followers, you can select who will see your post by narrowing it down a variety of ways, such as by company size, industry, geography, and more. LinkedIn’s new metrics are helpful to marketers because marketers will be able to get a more detailed look at who is interested in their brands and what kind of content their audiences desire. Social media marketing campaigns on LinkedIn can be adjusted and crafted more easily around a specific, familiar audience. After Facebook enhanced its Insights feature, it was easy for community managers to see what posts resonated the most with their audiences, and now posts on LinkedIn can be treated similarly. Being able to specifically define a demographic to see your company status updates will benefit brands by increased engagement because the people seeing your updates will be more relevant. The targeted updates also decrease the chances that someone would unfollow your company because of irrelevant content or too many status updates.